There are many tartans throughout the world that represent surnames, clans, military units as well as commemorative tartans for various events and groups. 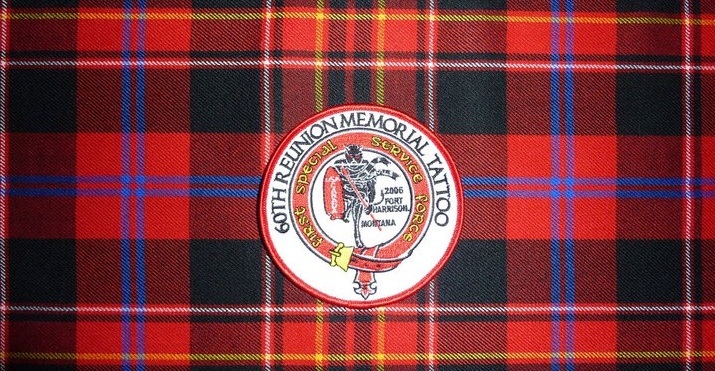 The First Special Service Force tartan was created in 2011 for the FSSF, aka "The Devil's Brigade" or " Black Devil's" as a commemorative tartan to represent the legacy of the only WWII special forces unit that was formed between two countries, Canada and the United States in 1942. The FSSF was formed in Helena, MT at Fort Harrison as an elite fighting unit that at the time was top secret and considered a suicide mission. The colors of the tartan are representative of the flags of both countries. Red, White and Blue. When the Canadian's pulled into Helena on the train they followed a piper and the Union Jack down the main street of town. The Red is also representative of the Red Spearhead patch the men wore to distinguish them from other military units. The Gold in the tartan is from the crossed arrow insignia they wore on the uniforms. The crossed arrows were adopted from the Indian Scouts used in previous US military campaigns. And the Black, of course, is to represent the moniker the 'Black Devil's' given to the men by the German soldiers for their daring night time raids. The Pipes and Drums of the Black Devils (formerly the Shining Thistle Pipe Band) was made the Official Pipe Band of the FSSF at the annual meeting at 2007 of the First Special Service Force Association. The PDBD is proud to wear the FSSF tartan and to keep the legacy of the 'Devils Brigade' alive. 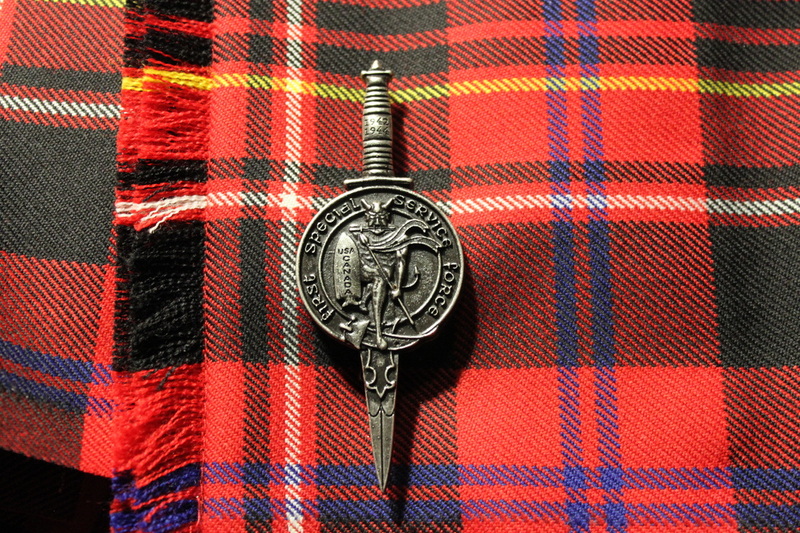 Pictured on the right is the Pipes and Drums of the Black Devils Kilt Pin.